IT'S HARD TO believe, looking at a slim Steve Blacknell, that he used to be 14 stone and played as a rugby prop. But then he has done a surprising variety of things in his life. Starting off as a nurse he found that he 'couldn't handle it', became a hippie, then did 32 jobs before deciding that record companies were the way into show business. He worked for seven of them before the fortuitous day when he went to a trial run of Riverside to be interviewed about his dial-a-waiter service and ended up being the presenter. In the last four years he has popped up all over the place - on Lifegames, Off the Record, Lift Off, Radio 1's In Concert, on MTV, a 24-hour pop video channel in the States, and has done the job reports on Breakfast Time and the film reviews for London Plus. 'But if you call me a mixed bag, Pirate Radio 4 is a real mixed bag,' he says, enthusiastically listing items to expect on the show (Thursdays): a	special Doctor Who story, though he has to say that 'my only brush with Doctor Who was my uncle's - who used to paint the scenery for the show. And recently I was zapped by a Cyberman on Breakfast Time'; a story about bikers called Lill; more adventures of Adrian Mole; and a group called Mint Juleps. He'll be presenting his choice from the top 40 albums, 'everything from Marillion to 'Marillion', running phone-in competitions and discussing magazines. 'I'm a real trash merchant,' he admits. 'I got Jackie up until last	week. At least, mentally I did.' There'll be activities like breakdancing, extracts from current comedy like Radio Active and The Grumbleweeds and comedy classics such as the Goons and Tony Hancock, 'and the more Hancock the better'. APA 6th ed. : Griffiths, Katie (1985-07-27). Pirate of the airwaves. Radio Times p. 86. MLA 7th ed. : Griffiths, Katie. 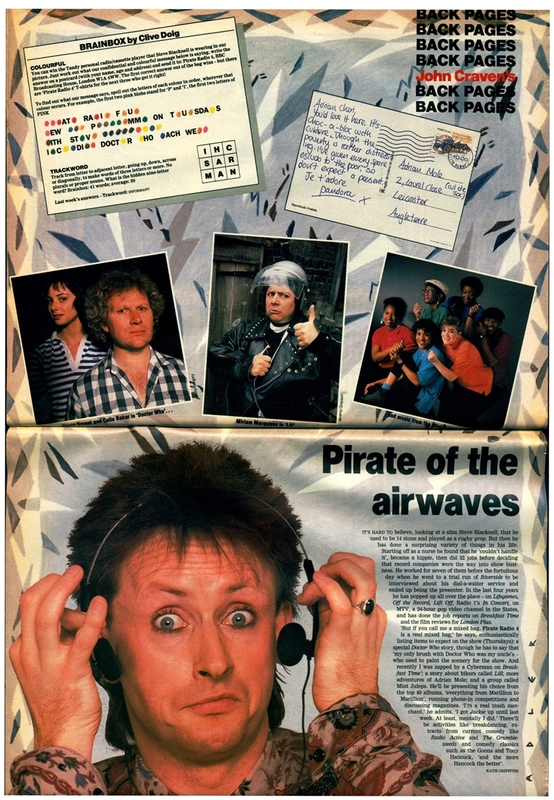 "Pirate of the airwaves." Radio Times [add city] 1985-07-27, 86. Print. Turabian: Griffiths, Katie. "Pirate of the airwaves." Radio Times, 1985-07-27, section, 86 edition. This page was last modified on 9 April 2019, at 23:23.